20th Century Fox has released a new photo of Bruce Willis and his co-star Jia Courtney (Spartacus) in A Good Day to Die Hard. The first thing I noticed in the picture is how calm and relaxed Willis looks, like whatever is going on is no big deal. After all he's found himself in some crazy intense situations four times before. That’s the thing about the Die Hard franchise, John’s always a fish out of water. What could be further out of water for him than Russia? The relationship isn’t always functional. These are two guys who have been estranged for some time. John likes to wing it, see what happens. Jack’s more of a strategist. The movie hits theaters on February 14th, 2013. Are you looking forward to seeing McClane back in action?! Did you like the last Die Hard film? 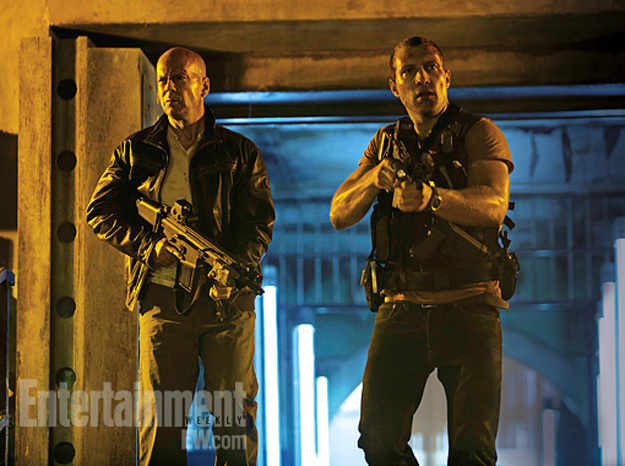 A GOOD DAY TO DIE HARD - Two New Action Packed TV Spots!